Leading the way in water, wastewater, and reuse treatment solutions, Fluence believes that everyone – everywhere – deserves access to clean water. There is no cost-effective technological reason that individuals, communities, or industries should experience water scarcity. The NIROBOX™ family of solutions challenges convention by providing advanced treatment technologies in affordable and compact packages. Nirobox offers the industry’s smallest overall footprint, which makes the units ideal for the industrial, municipal, and commercial markets. With models for desalination of seawater and brackish water, and models for treatment of fresh water and wastewater, the Nirobox line of products will provide a suitable solution to your needs. 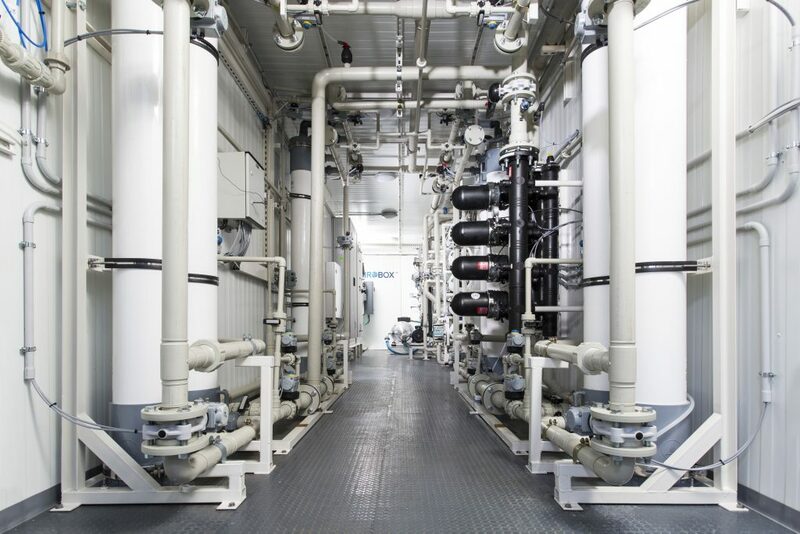 Nirobox streamlines the economic, environmental, and logistical challenges associated with large-scale desalination and centralized water treatment plants. Nirobox offers flexible, affordable solutions with minimal environmental impact at the most competitive cost available. We’re here to help! Contact us to learn more about our wastewater treatment solutions, or to discuss your next project with our experts. 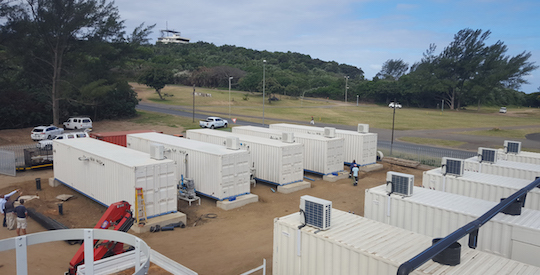 NIROBOX™ treatment units are available in a number of configurations to suit your site’s size and capacity requirements, allowing fast integration, commissioning, and operation. Nirobox building blocks are modular and can be adapted to your requirements, providing an independent solution on virtually any scale, from single, self-contained units to large water and wastewater treatment plants. We offer NIROPLANT and NIROSITE installation options when large-capacity solutions are required. Niroplant and Nirosite are the ideal solution for decentralized water treatment plants, where ease of operation, lower capital costs, fast delivery and a modular approach are required. Our preassembled Nirobox plants are housed in standard shipping containers and are ready to go. They’re engineered for fast deployment, as well as simple operation and maintenance. They also integrate the most energy-efficient components available. Due to smart pre-engineering and design, Nirobox is ready for integration with other systems and equipment. It is completely modular, allowing for capacity upgrades if required. Multiple pre-engineered configurations are available, enabling fast delivery, integration, commissioning, and operation. Low energy consumption and chemical use reduce the environmental impact of Nirobox plants. The boxes’ unique, patent-pending design provides a unique configuration of low-energy membranes, positive displacement high-pressure pump, work exchanger energy-recovery device, and variable frequency device (VFD). The Nirobox is the lowest carbon footprint desalination plant in its class. Nirobox’s modular containers can be easily moved for redeployment or resale should your water treatment needs change. Nirobox’s compact footprint minimizes site impact, lowers the cost of site development, and ensures easy expansion. Nirobox’s operating systems are fully automated, and remotely monitored and operated, which allows optimization of flow rates, chemical consumption, energy consumption, and more. Our smart design keeps ongoing equipment, operation, and maintenance expenses in check. Data and reports are easily accessible from anywhere on any platform. Real-time alerts can be sent for system malfunctions or abnormal performance. 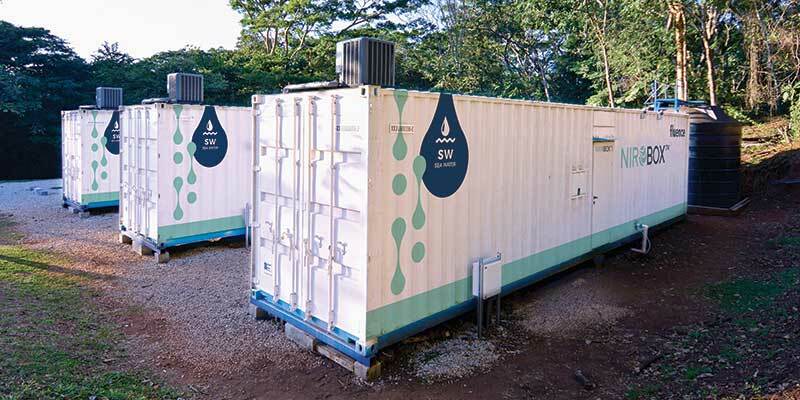 NIROBOX™ SW is a modular, high-output, membrane-based and efficient seawater desalination solution that offers pretreatment, reverse osmosis, and post-treatment – all housed in a single, self-contained 40-foot shipping container. Nirobox SW is suitable for a variety of applications, including desalination for potable or industrial water, and can meet the most stringent regulatory requirements. Offering industry-leading capacity, a single Nirobox SW container can produce up to 1,500 m3/d (275 GPM) of permeate water, making it the most compact plant-in-a-box. Nirobox SW offers recovery rates of up to 50%. This, along with low chemical and energy consumption, reduces overall operational costs. Nirobox SW’s patent-pending process includes a cleaning process for the ultrafiltration membranes that inhibits microorganism growth and scaling. This natural disinfecting effect lowers energy and chemical requirements, and minimizes the plant’s ecological footprint. Moreover, Nirobox SW features a work-exchanger energy recovery device with the lowest energy consumption in the industry. Nirobox SW is designed to treat seawater with total dissolved solids (TDS) between 15,000 and to 45,000 ppm, turbidity of up to 20 NTUs, and oil and grease up to 1.5 ppm. Additional, optional pretreatment processes in the front end like dissolved air flotation (DAF), clarification, and activated carbon filters (AC) will widen the range of feed water quality. Fluence provides supervision of erection, start up and commissioning, operator training, full operational and maintenance support/contracts. 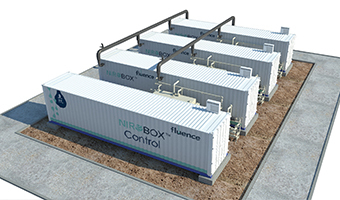 Contact Fluence to learn more about Nirobox seawater desalination, or to discuss your next project with our experts. Seawater reverse osmosis (SWRO) – rated 1200 psi. Optional pretreatments include dissolved air flotation, multimedia filtration, activated carbon filtration, clarification, and post-treatments include remineralization, pH adjustment, and ultraviolet or chlorine disinfection. NIROBOX™ BW is a modular, highly efficient desalination solution for brackish water. It delivers potable water, industrial process water, and high-quality water for irrigation and other applications. Designed for flexibility, Nirobox BW treats water from a wide variety of sources, including surface water, groundwater, and well water, and can handle turbidity, salinity, and a wide range of contaminants, from 1,000 to 10,000 ppm total dissolved solids (TDS). Each is available in three feed capacities: 1,000, 1,500, and 2,000 m3/d. Output water capacity depends on recovery and water-feed specifications. All options are housed in a single, self-contained 40-foot shipping container. Nirobox BW offers recovery rates of up to 90%, while boasting low chemical and energy consumption. Nirobox BW’s patent-pending process includes a cleaning process for membranes that inhibits microorganism growth and scaling. This natural disinfecting effect lowers energy and chemical requirements and minimizes the plant’s ecological footprint. Nirobox BW is ideal for a wide variety of applications, delivering the reliability and robustness needed to meet the operational requirements of municipalities, industries, commercial users, power plants, hotels and resorts, and others. Fluence provides supervision of erection, start up and commissioning, operator training, full operational and maintenance support/contracts. 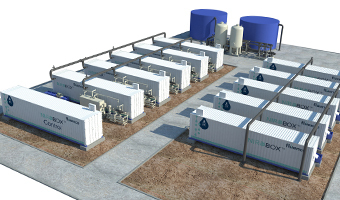 Contact Fluence to learn more about Nirobox brackish water desalination, or to discuss your next project with our experts. Brackish water reverse osmosis (SWRO) – rated 300 psi. NIROBOX™ FW is a modular, self-contained system that treats feed water from non-saline sources such as rivers, lakes, or wells. The units can handle total dissolved solids (TDS) up to 1,000 ppm. Nirobox FW uses advanced membrane filtration technologies to remove turbidity, microbes, and other solids, bringing water up to potable standards. 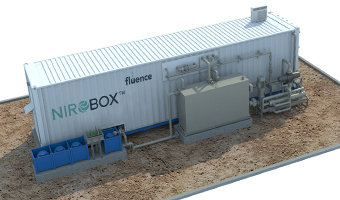 A single, compact Nirobox FW unit, housed in a 40-foot shipping container, can produce up to 5,000 m3/d of clean, high-quality water that can be used directly for drinking or as industrial process water. The modular Nirobox FW maximizes capacity while minimizing footprint and keeping operational overhead in check. Nirobox FW systems allow flexible up-scaling to almost any capacity. Treated water meets or exceeds the most stringent potability standards, including the World Health Organization’s. Fluence provides supervision of erection, start up and commissioning, operator training, full operational and maintenance support/contracts. Contact Fluence to learn more about Nirobox freshwater treatment, or to discuss your next project with our experts. Ultrafiltration membranes to retain solids particles and microorganisms up to 0.01 μm. One of the main advantages of Fluence’s family of NIROBOX™ solutions is scalability. 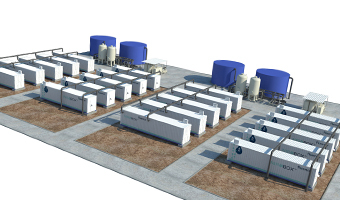 Our NIROPLANT and NIROSITE options show how you can use individual units, housed in standard 40-foot shipping containers, to create customized treatment plants with large capacities. Both Niroplant and Nirosite modular assemblies use a minimum of three individual Nirobox units. They both are quick to deploy and offer lower capital expense, and comparable or lower operating expense. The main difference is in how the Nirobox units work together. Niroplant uses the Nirobox as stand-alone units with a centralized control unit and optional post-treatment. This allows the plant to be scaled up or down without losing individual operability of each box. Niroplants can handle up to 20,000 m3/d. Units can be easily removed and relocated according to changing requirements. Nirosite offers an end-to-end solution that achieves greater operating and maintenance efficiencies for larger-capacity plants. Nirosite installations feature centralized peripheral functions, including control and monitoring, air compression, chemical dosing, flushing, and CIP. Nirosite is expandable through the addition of operating clusters. No matter how small or large your treatment needs are, Nirobox’s pre-engineered systems arrive wired and assembled for a fast, affordable and compact solution. Contact Fluence to learn more about our Nirobox product line, or to discuss your next project with our experts.